Learning to cook with the cuts of beef and lamb that are traditionally used in slow cooking can add some delicious dishes to your repertoire, as well as providing a saving on the housekeeping budget. On any animal, you choose the cooking method that suits the cut of meat. As a rule of thumb, cuts that have more collagen and less fat are best suited to long, sustained cooking in a moist environment to provide optimum tenderness. On the plus side, these cuts also tend to have a better and more robust flavour. 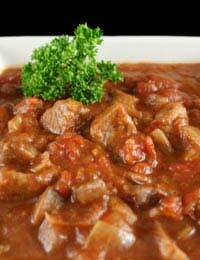 Slow cooking is also ideal for those who work all day and like to come home to a hearty, ready-cooked meal. Many dishes can be left for six or eight hours without compromising their flavour or nutritional qualities. Brisket comes from the underside of beef and can therefore be a little fattier than other cuts which means that it adds to the flavour of stock when cooking and is best served with an accompaniment that cuts the fat such as a tangy tomato sauce or with potato dice that will soak up the fatty taste. Silverside is a very nice rolled joint that is ideal for braising or pot-roasting. You can use a slow cooker, also called a crock pot, or a casserole in the oven. Slow cookers have two advantages: they use less energy (meaning they are cheaper) and the meat cannot dry out, even if it overcooks. While browning beef and lamb isn’t necessary, it has two advantages: it keeps the high temperature in the cooker or casserole, and it caramelises the meat juices which gives a better colour to the finished dish. When trimming beef or lamb for slow cooking, don’t remove all the fat as it contains a lot of the flavour – leave a little, as it will rise to the top of the dish during the cooking period and can be skimmed away before serving. Don’t over-season slow cooked meals. As they cook down slowly, the flavours will intensify, particularly the saltiness of a dish which can easily become overpowering – if this happens, slice a potato thickly and lay it on the top of the dish for half an hour – it will soak up a lot of the saltiness. Then add a squirt of lemon juice, which often reduces the taste of salt.